Located in Chanhassen Minn., Knight Construction Design Inc. was founded in 1993 and has over 40 years of combined construction, design and remodeling experience. From kitchen and bathroom remodeling to exterior home renovation, the Knight Construction Design Team treats every renovation project as if it was their own home. Whether it be a bathroom, kitchen or laundry room that needs renovation, Knight Construction is only satisfied when the project is completed and the customer is happy. A.Sadowski Designs is a full service design firm specializing in spatial reconstruction, additions, remodels and everything related to the home. Our goal is to transform your living environment in a way that responds to your personal style while balancing details and color. Repeat BEST OF HOUZZ winner with over 30 years experience designing custom homes, we work across the country on projects just like yours. Located just west of the Twin Cities in Excelsior near Lake Minnetonka, Sharratt Design & Company is an architectural practice dedicated to creating signature work by expressing our clients' character, lifestyles, and spirit on each and every project. We design new and remodeled single-family homes, cabins and lofts, as well as assisted living facilities, commercial projects, office spaces, restaurants, and multi-family homes and communities. Each of you brings your own perspective, style and experiences to the design process; so working collaboratively with you, every project we design is unique. Our designs blend the influences of the project's climate, site and budget; and must be coaxed through the planning and zoning requirements of each community. This collaborative, custom approach to design leads us to work in many styles. We strive to create architecture that transcends style; buildings with integrity that express each client's signature, and that integrate seamlessly with their surrounding natural environments. Love coming home! 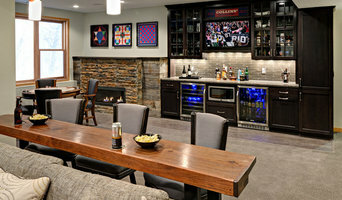 JP&CO is a Residential Design & Construction Firm that specializes in unique home design, large scale renovations, and new construction rebuilds for clients in the Twin Cities and across the country. Creating a home that works effortlessly for the way you live and promotes wellness is our top priority. Whether we are working from scratch with new homes or creating a new space in a renovation, we create a vision that brings all you are hoping for in a home to life. Extra care is taken to ensure we are designing and building a healthy home your family will enjoy for years to come. JP&CO founder, Peter, entered the design and construction world after years working in business and education. Pete brings a tremendous amount of innovation and creativity to the process of home building. His enthusiasm and involvement in every stage of construction ensure the highest quality in every aspect of our homes. Samantha is the principal designer for JP&CO. With a degree in architecture, she takes a unique approach. She creates spaces that are casually sophisticated, timeless in design, where you and your family live comfortably. She is deeply committed to a creative approach, giving you highly functional spaces with an aesthetic appeal for everyday living. Since 2000, the JP&CO team has used their diverse areas of expertise to continuously create better homes and better experiences. Archos Architecture & Design, P.A. SKD Architects, Inc. is a Minnesota based company, established in 1977 by Steve Kleineman, AIA, CID. We are a full service architectural firm that provides creative design for residential and commercial projects. We pride ourselves in achieving smart, functional design with special attention to detail in artful ways. A well designed home that is integrated into its surroundings is a top priority for us. Each project is a work of art that will evoke emotions from within. Whether it be modern, contemporary or traditional, SKD will create a home that will nourish your senses by creating visual excitement and creative design. Knowing that each project is unique to each client, the end product will enhance your qualities of living, working and playing in your day to day lives. As an architectural firm that is responsible for designing luxurious homes, we find in necessary to be environmentally accountable by infusing our projects with "green" products and practices. Though we have repurposed, recycled, rethought, and reengineered all along, the time has come for a purposeful and blatant redirection toward these important facets of design and construction. Sustainable art. We have clients throughout the United States living in a "Steve Kleineman Design" that let us know, year after year, that they still "love" their home. Timeless and functional and creative and beautiful. Specializing in Residential Design of New Homes and Remodel projects. Jeff 's love of contemporary design, the Arts and Crafts movement and period architects Voysey and Green & Green have helped him create his own style, which he calls “contemporary traditionalism.” For Jeff, it’s all about balancing the old and the new. Devoted to authenticity, Andrea's work is a spirited balance of modern sensibilities with traditional order. 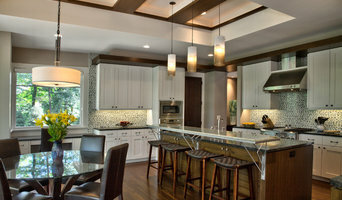 Boldenow & Associates is an upper end builder of new construction as well as remodels & additions. We create the homes our customers dream about. The Boldenows began dreaming of Meadowmoor Cottage, an authentic English custom design, 15 years ago-at least, that's when they both fell in love with the style and character of the architecture. But their love of antique pastoral furnishings and home accents began long before that. "I've been in the business of building homes for over 37 years," says Jerry Boldenow. "But working on my own home really gives me an opportunity to engage in my passion." Jerry has built million dollar homes in the Twin Cities for many years. Many of these homes have included some components of traditional English Tudor or French designs. With his home, however, he is able to create his own vision of the perfect home, bringing together his building expertise with his knowledge and love of antiques and the 'wonky' stylings of old English cottages. "We can build a home in any period, or any style our customers wish." 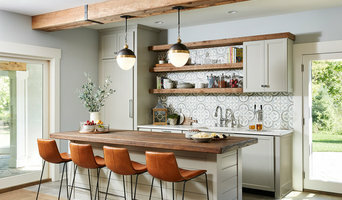 Twin Cities Award Winning Architectural Firm - Best of Houzz 2018 Winner Principal Architect & Owner, James McNeal has an ability to approach each project as a brand new opportunity, starting with a conversation with his client about their dreams, and building ideas throughout the process. The process? Clients get sketches at each stage, so they know exactly what's coming up. No surprises, no stress. No other Architect walks side by side with clients like James McNeal does; no other Architect communicates so well through sketches done right at meetings. You'll start thinking about your project three-dimensionally, just as James sees it all along. JMAD, or James McNeal Architecture & Design. Is owned by the registered architect, JAMES McNEAL. "Creativity oozes out of his fingertips." That's what colleagues say about Jim McNeal. He is registered in Minnesota & Florida and in the process of registering with Wisconsin. He is also NCARB certified to practice in the United States and internationally.